Le Brassus, 14 June 2018: Swiss Haute Horlogerie brand Audemars Piguet celebrated the unveiling of its 4th Art Commission, HALO, during Art Basel in Basel 2018. 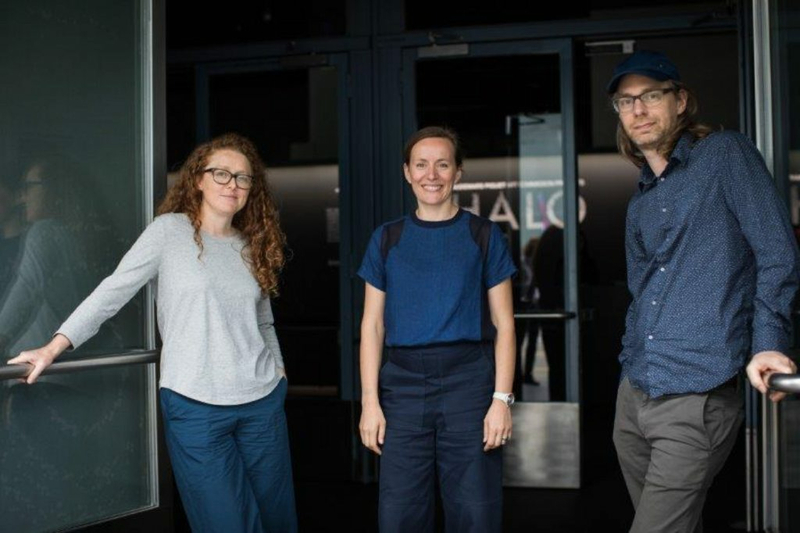 This year, the Audemars Piguet Art Commission was conceived and realised by British artist-duo Semiconductor, Ruth Jarman and Joe Gerhardt, in collaboration with guest curator Mónica Bello, head of Arts and curator at CERN, the European Laboratory for Particle Physics in Geneva. HALO, the large-scale, site-specific artwork, presents visitors with an artistic interpretation of the ATLAS experiment at CERN, and marks the first time that raw data from CERN has been utilised within an art installation. The manufacture celebrated the debut of the 4th Audemars Piguet Art Commission with a press conference and cocktail party. Guests experienced first-hand the immersive installation, presented as a ten-metre-wide and four metre tall cylinder-shaped structure, made up of vertical piano wires and a 360-degree screen. Viewers were entirely immersed in HALO, surrounded by kaleidoscopic data projections generated by a series of slowed-down subatomic particle collisions that ordinarilly occur almost at the speed of light at CERN's Large Hadron Collider (LHC). As they hit the screen, the animated data points trigger small hammers that proceed to reverberate the artwork's body, emiting an all-encompassing vibration resonating throughout the artwork. Artists Ruth Jarman and Joe Gerhardt of Semiconductor described the project, saying: "We're interested in man's signature on nature. Our aim is not to learn about the scientific knowledge, but seeing what it has become once it has been observed by man. This quickly becomes a process of pattern reading which is something we as humans are doing all the time. We want people to experience what we call a 'technological sublime', you don't need to know anything about the science to do this. It becomes an experience". They add about their collaboration with Audemars Piguet and visiting its headquarters in the Vallée de Joux: "Visiting the [Audemars Piguet] workshops and meeting its watchmakers was an interesting element of the project. Audemars Piguet has much in common with the technology at CERN in how it strives for the limits of what's possible at the extreme ends of human scales and it can't be ignored that in HALO, we have made a giant instrument that posseses qualities found in the Large Hadron Collider at CERN as well as the Audemars Piguet timepieces we discovered in Switzerland". Guest curator Mónica Bello said of the artwork: "HALO is highly original, truly intellectual and very scientific in its own uniqueness". Developed out of their two-month residency at CERN in 2015, Semiconductor was selected by Audemars Piguet and 2018 guest curator Mónica Bello for their exploration of the limits of physical phenomena and their artistic interpretation of the natural world. The Audemars Piguet Art Commission collaborates with a selected curator and emerging or mid-career artist to realise a new artwork that is premiered during one of Art Basel's three international shows. The aim is to amplify the artist's unique vision, while using the complexity and precision inherent in watchmaking as the artist's stimuli. This year, Mónica Bello helped select Semiconductor whose work reflects the continuing exploration of these themes, celebrating a dialogue between contemporary art, science, and technology. During Art Basel in Basel, Audemars Piguet also showcased the concluding design in a trilogy of lounge concepts by Chilean-born, New York-based artist and designer Sebastian Errazuriz, alongside a photographic series by London-based, Italian visual artist Quayola at the Audemars Piguet Collectors Lounge. Errazuriz's Foundations, which is based on iron ore, the natural resource at the heart of steel and one of the principal resources for watchmakers, was previously on view at Art Basel Hong Kong, and will feature at Art Basel Miami Beach later this year, rounding out all three Art Basel shows in 2018, a venue where Audemars Piguet has presented innovative concepts in the Collectors Lounge since 2013. This design evolves from the previous lounge concepts which were inspired by two other core natural materials native to the Vallée de Joux -- ice (Ice Cycle, 2016) and wood (Second Nature, 2017). Similarly, Quayola's new photographic series, Remains: Vallée de Joux, unifies the natural roots of Audemars Piguet with his own visual artistry. Throughout 2018, Quayola's artwork on the lounge will evolve, concluding in December at Art Basel in Miami Beach with the reveal of a new moving-image artwork: Promenade, a video diptych captured through drone technology and high-precision scanning. Quayola's works use recent high-tech innovations to help viewers see the natural world in alternative ways, while his techniques reflect the careful craftsmanship and precision of watchmaking.